A wonderful, 'Old Florida,' Beach house. This island home is decorated with a nautical theme. Walk the beautiful hardwood floors and watch the sunset from the over-sized rear porch. Minutes walk on a sand road to the quiet seven-mile beach. This beach is perfect for swimming or collecting sea shells. You have to travel far in this world to find a beach like this. Turtle Landing has an open floor plan, and comes with all the trimmings. Perfect for a family or friends to enjoy a stay at Palm Island. House has cathedral ceiling , large yard and a nice pool & spa. Out the back porch is a long dock that is great for fishing, kayaking or swimming in Kettle Harbor. In the house, we offer streaming video and TV entertainment with over 2000 movies and programs. Turtle Landing will leave you in the 'old Florida' style that you expect. Island is accessed by ferry which operates 18 hours each day. Driving time is one hour and fifteen minutes from Tampa, Florida. Golf cart rentals available on Island. All linens are furnished. Please bring beach towels with you. Starter amount of Paper Towels, Toilet Paper and Salt and Pepper provided. Kitchen is well-equiped for any meal. House has two dining tables for large parties inside and outside. Most guests prefer to eat on the porch. •	Bluetooth speakers that connect to your phone (Tribit XSound) •	The compact but powerful Tribit speaker delivers rich, clear, room-filling sound like you’ve never heard before. Blu-Ray DVD in the living room. A good idea to bring your favorite DVD movies with you. House collection includes many games and plenty of puzzles for a rainy day! Bring your favorite play list because we offer blue tooth speakers for your phone to connect with. Collection of children's toys for use in the covered sandbox. Turtle House for our favorite friends located on the water. 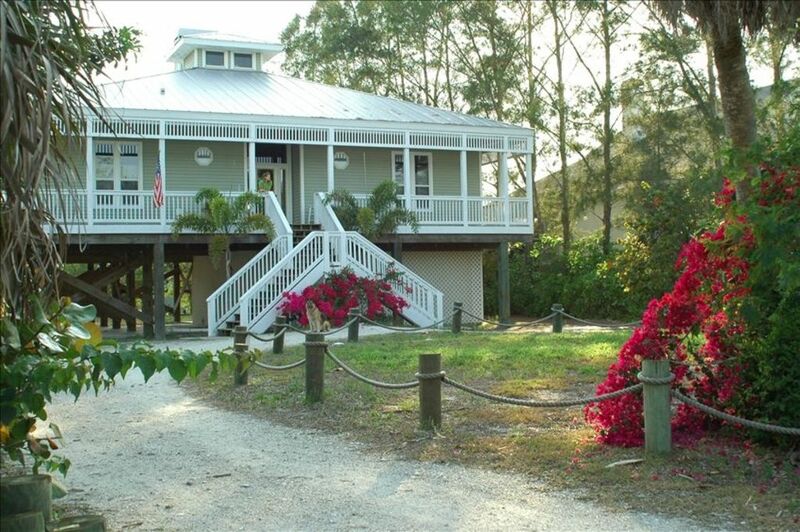 Turtle Landing has a very large screened-in patio that contains living room and dining space. House has complimentary beach chairs for use at the beach. The Hot Tub is waiting for you during the winter months! Boat Dock with 3 foot draft is located on property. Dock is perfect for childrens fishing or relaxing. Lighting, Electric outlet and water are available on the dock. This was our first time to Palm Island and we all really enjoyed it. Very friendly and helpful management. This was a very clean and inviting home. Everything was as described or better. It is everything and more that the pictures and reviews say. Quiet fun perfect. Truly special. Breakfast at the end of the long dock every morning. Porpoise making his way up the lagoon. Biking all over the island and of course the beach! We swam in the pool and in the gulf all the time. Perfect weather day after day and great dinners in the porch. We will be back probably more than once. Perfect for our family of five (kids are 2, 4, and 11). This was my family's second vacation spent on Palm Island. We returned because my 9, 12 and 14 year old always said it was the best Florida vacation they'd ever had, and this trip didnt disappoint. We were extremely pleased with Turtle Landing and it's amenities, from the spacious and stylish screened in porch, to the open living space both inside and out. We actually thought the home was newer than it truly is because it is so well maintained and decorated. It didnt have the tired and worn out feeling that many rental homes have. I was pleased with the communication with Scott, the property owner, who sent a comprehensive email before our stay and made himself available fo any questions during our stay. Palm Island has an old Florida feel, where most people travel by bike or golf cart, everyone seems friendly, and life seems slower. If you're after a spot with nightlife, stores, and clubs this isnt the place for you. But if you want a to sip rum punch next to beautiful pool with Buffet playing on the portable speaker, catch fish with your son on the private dock, bike or kayak with your kids, watch Osprey fly overhead or see Gopher Tortoise or Fiddler Crab burrow in the sand, this is the place for you. You will have miles of beach virtually to yourselves to find millions of years old fossilized shark's teeth and beautiful shells. You'll will see the most gorgeous Gulf sunsets imaginable. We rented a golf cart and enjoyed exploring the island and going to the resort for ice cream. Islanders were very friendly. The ferry ride with a car is expensive, so planning to stop for groceries before arriving will ensure you can enjoy your vacation without needing to leave. The fact that there's no bridge also ensures you'll have miles of beach to yourselves, unlike Sanibel, and hardly any traffic. We enjoyed our stay at Turtle Landing so much that we will return again someday. Location = Palm Island is great, beaches are beautiful and secluded. We found shark teeth, crabs, and shells of all kind. Pool + Outside = The pool and backyard are 5 stars, very hard to beat. It’s even better than the pictures. Amenities = You’ll have a hard time finding a longer list than what this place has to offer. Response time = both Scott (owner) & Barbara (property manager) respond quickly to questions and concerns. Inside = Needs some TLC here, could invest a little money in updating/replacing older flooring's and furniture, as well as small things like burned out light bulbs. Cleaning = We had to spend several hours cleaning as it was not up to our standards. I’ll admit that our standards are high and since no other reviewers mentioned this its hard to say if they skimped on us or what happened. The biggest issue was that Scott has a dog/s that he must bring to the house from time to time, so when we found a fair amount of dog hair in a “no pets” property it was alarming. Summary: We have been spending a week in FL every winter via house rentals for around 10 years. This is our first time on Palm Island, and we would consider going back. If Scott invested in cleaning/updated the inside we would certainly love to come back to this home, however in the current condition I’m not sure we would consider it. Other places we have stayed for the same price have been more up to date and better cleaned. It's everything that is advertised, and MORE! What a house.. Shell Collecting..this is a great place for finding shells on the empty beaches of Palm Island. 10% discount offered to Military Paypal payments accepted Federal Holidays are priced at $360 per night.